Proof of concept. Freedom of expression includes groups such as Hezbollah and al Qaeda. This is a no brainer. Welcome to free country. GNU-Darwin-org coming up again. Still need to change the power supply. Maybe Thursday. although there may be more companies that support #SOPA. Congress has agreed to a two-month payroll tax and unemployment extension bill that forces a decision on the Keystone XL Pipeline, and by all accounts President Obama will sign it. for your friends, just like it should. Have fun, and explore! 1 arpa domain name pointer 0trace.de. 1 arpa domain name pointer 188-72-223-162.local. 1 arpa domain name pointer 188-72-225-172.local. 1 arpa domain name pointer 212-95-39-82.local. 1 arpa domain name pointer 217-20-114-254.local. 1 arpa domain name pointer 95-168-189-49.local. 1 arpa domain name pointer alexdpsg.net. 1 arpa domain name pointer amongsari.de. 1 arpa domain name pointer aragon.nl. 1 arpa domain name pointer audiotraining.org. 1 arpa domain name pointer cdann.de. 1 arpa domain name pointer doook.com. 1 arpa domain name pointer dream-irc.net. 1 arpa domain name pointer exploits.com. 1 arpa domain name pointer goldfish.org. 1 arpa domain name pointer hartois.info. 1 arpa domain name pointer heihachi.net. 1 arpa domain name pointer kaputte.li. 1 arpa domain name pointer macht.org. 1 arpa domain name pointer niufenche.net. 1 arpa domain name pointer phoenitydawn.de. 1 arpa domain name pointer pprz1.de. 1 arpa domain name pointer privacybox.de. 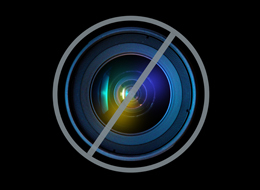 1 arpa domain name pointer privacy.is. 1 arpa domain name pointer rickb.net. 1 arpa domain name pointer ritter.vg. 1 arpa domain name pointer shiven.net. 1 arpa domain name pointer spamik.cz. 1 arpa domain name pointer stargrave.org. 1 arpa domain name pointer tjtechco.com. 1 arpa domain name pointer unpatented.com. 1 arpa domain name pointer vpn-service.biz. 1 arpa domain name pointer vpn-service.ws. 1 arpa domain name pointer watchdog.net. 1 arpa domain name pointer wxs.ca. 1 in-addr.arpa domain name pointer maxideia1020. 1 in-addr.arpa domain name pointer tor-exit-node-see-www-torproject-org. 1 in-addr.arpa domain name pointer unknown. 10 in-addr.arpa domain name pointer . Name: (10dollar.ca) 10 Dollar Domain Names Inc.
Bradley Manning is facing a terrible injustice, but it could happen to anyone of us, if we don't defeat this criminal legislatio­n. We need your immediate help -- please call your senators tonight. The Senate is about to undermine our clean-air laws to pave the way for off-shore oil drilling in pristine Arctic waters if we don't stop them. Alaska Senator Lisa Murkowski snuck a deal into a government funding bill that creates a loophole for oil companies to bypass clean air laws, and Congress is voting on it tomorrow. If Senator Murkowski gets her way, the Environmental Protection Agency will be unable to ensure that drilling projects in the Arctic meet clean air standards, sacrificing Native communities as well as polar bears and other imperiled species. The vote on this bill could come as early as Saturday morning. Please call and email your senators right now, before it's too late, and tell them the health of Arctic communities and wildlife comes before oil company profits. Holy moly. We did it -- at least for now. The House Judiciary Committee looked certain to vote for the Stop Online Piracy Act today. Instead, because of the work of so many rank-and-file Internet users, the bill's lead sponsor acknowledged that our concerns are legitimate, and adjourned the committee without holding a vote! The House Judiciary Committee considering whether to send the Stop Online Piracy Act to the House floor abruptly adjourned Friday with no new vote date set – a surprise given that the bill looked certain to pass out of committee today. We need your help. Would you tell the President to veto the Defense Authorization bill that allows the government to jail Americans indefinitely? If he doesn't we'll take our country back over 200 years. I have been luvin' the PLSweb.org blog. Hope you enjoy it too! On Dec. 12, the Occupy movement called for a West Coast port shutdown. Targeted ports included Seattle, Los Angeles/Long Beach and Oakland. Seeing this made my day. Have a healthful. Enjoy the pictures. Occupiers should be arriving soon. If Wikipedia goes dark, so will GNU-Darwin. 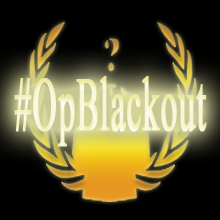 We are already participating in the blackout. Held oder Saboteur? Der schwerste Vorwurf gegen den Gefreiten Bradley Manning lautet "Hilfe für den Feind". Jetzt wollen die politisch Mächtigen in einem Militärprozess mit dem mutmaßlichen WikiLeaks-Informanten abrechnen. Wenige glauben, dass der straflos davonkommen wird. Right now there's a great proposal on the table to protect Hawaii's coasts and waters for monk seals, but an effort to mislead people about the rule threatens to undermine desperately needed protection for a majestic creature on the brink of extinction. The period for public comment has been extended, so please -- speak out now to save the monk seal's critical habitat. For monk seal babies in northwest Hawaii, the chances of surviving to adulthood are bleak. Only one in five will last the first year. The new habitat protections will ensure that monk seals can raise their pups safely around the main Hawaiian Islands without the risk of starvation faced elsewhere. Saving these beautiful seals from extinction means conserving the Hawaiian coastlines they rely on to survive; protecting our beaches is good both for the seals and for everyone who enjoys the surf. Bloggers/internet users: (1) Add the WikiLeaks donations fundraising banner to your site with the following instructions: http://wikileaks.org/wlnet.txt. (2) Create awareness over what WikiLeaks has revealed in its five years of existence, refute the smears, dispel the misconceptions, set the record straight. Demand from the editors good, fact-based journalism when it is lacking. The Senate is willing to surrender a fundamental part of our democracy. And they are going to do it in the name of "fighting terrorism." This past week, the Senate passed a major defense spending bill, the National Defense Authorization Act, which included a provision authorizing the U.S. military to pick up and indefinitely detain civilians accused of supporting terrorism--including American citizens--anywhere in the world without charges and without a trial. The House passed its own version of the defense spending bill, and right now House and Senate negotiators are meeting behind closed doors to reconcile the differences between the two bills. We need to speak out today. The House will vote on the final, reconciled bill in the upcoming week. Tell Congress: Say NO to indefinite detention. Click the link below to find out more information and easily take action. Happy to support the #OpManning blog. It is a good read, as always. Help free a Facebook activist jailed in Azerbaijan! media protest to help free Facebook activist Jabbar Salavan. the Azerbaijan government to immediately release Jabbar. The is more info and examples at http://mobile-x.org/. If you just want to make a few of them, there are also web apps that can make them. Just google search on qr-code web apps. JANUARY 17TH 2012 - Occupy Congress. Don't feel bad if your blog is not in this initial list. I dig around with Google, and I can't say that I am privy to any elite knowledge, as it were. You should also note that if no one submits anything, that some folks will consider this to be a complete list already. 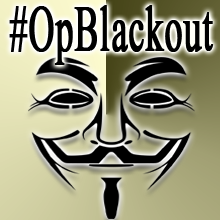 If someone already has a list a list of high quality Anonymous or Occupy blogs, feel free to post a link. While have your attention, I would highly recommend including qr-codes in Anonymous paper storms and Occupy leaflets. Check http://www.mobile-x.org for code and examples. Feel free to take these ideas into your collectives and do it your way instead. I think these suggestions would be a great way to improve the Occupy blog network too. Turn on RSS, because people want to see your updates in Google Reader. If you include a qr-code in your leaflets, then people can link directly to your website with their smartphone, without typing the address. Web geeks like me did things like these before it was possible to retweet. By interlinking our sites, we amplify our message. Tyler, there I said it. It sounds really simple: The largest banks that caused the housing crisis that led to our economic meltdown should be investigated fully, punished to the full extent of the law, and forced to compensate their victims for the harm they caused. But the Obama administration is pressuring state attorneys general to quickly cut a deal with the banks that lets them off the hook for massive amounts of mortgage and foreclosure fraud. Representative Tammy Baldwin is pushing back. She has introduced a resolution that supports taking a tough line with the banks. The more members of Congress who cosponsor it, the stronger the message it will send to President Obama that he cannot give Wall Street a "get out of jail free" card for mortgage and foreclosure fraud. Tell House Democrats: Stand with Tammy Baldwin and stand up to Wall Street banks. Click the link below for more information and for an easy way to take action. Visitors to the GNU-Darwin site will notice something new starting today. 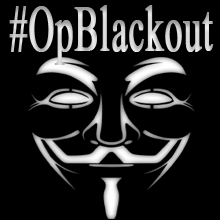 Please take time to sign on, contact your legistlators, and support a free internet. One of the most outrageous things about the Adobe plugin architecture is that it doesn't provide a browser source link unless you have the plugin installed. Our problem is not with technical details of the plugin, but rather weth the fact that it is not software freedom. At any rate, here is the source link. BTW, it will remain GNU-Darwin policy to leave Adobe software uninstalled. You may find that non-video content is more enlightening. The bluefin tuna is more than sushi; it’s a top predator and critically important component of our oceans. As we did with whales, bears and buffalo, humans are hunting it to the verge of extinction. Boycott bluefin tuna to stop its overharvest. Even though it’s endangered, the bluefin tuna remains on the menu of many sushi restaurants. Sign our pledge to boycott those restaurants to stem the insatiable demand for this species. Visit http://action.biologicaldiversity.org/p/dia/action/public/?action_KEY=5209 to take action now. In a free country, the government can't snoop through your laptop without any suspicion of wrongdoing. But the United States has carte blanche to search and copy your files at the border. Our lives are on our laptops - family photos, medical documents, banking info, details about what websites we visit, and so much more. But when it comes to searching travelers who are entering the US, the government can take a laptop or smart phone, search through all the files, and keep it for further scrutiny - without any suspicion of wrongdoing whatsoever. Civil liberties organizations like EFF have been battling in court for American constitutional protections at the border for years, but to no avail. That's why we're calling on Congress to take action to defend the privacy rights of travelers. Will you sign our petition to Congress today and urge them to rein in border searches? For doctors, lawyers, and many business folk, invasive border searches compromise the privacy of sensitive client communications. And for the rest of us, invasive searches are an affront to our privacy and dignity. As technology advances, it gets easier and faster for minimally trained border agents to conduct penetrating forensic analysis on our laptops in moments. Urge Congress to stand up for up for the privacy and dignity of travelers, and to stop invasive border searches. Click the link below to sign the petition. © 2011 Imgur, LLC. All rights reserved. On Nov 30th, you can express solidarity with Operation Blackout by replacing your avatar picture with one of these icons. Many will want to continue with the action into December or longer. Find more at the following link, including some non-Anonymous ones, or make your own. 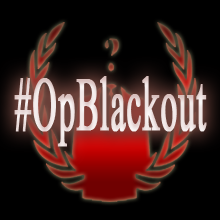 Some are using just the #OpBlackout tag in the image. 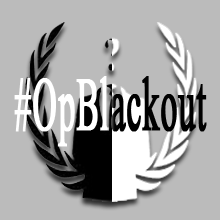 If you dedicate your feed to the operation, a plain black square says a mouthful. Fight censorship! Stop SOPA! Stop PIPA!